Let's face it, getting traffic is hard, you could write a load of articles, mess around with your site trying to optimize it for the search engines for a few months, or you could just plug yourself into the raging river of traffic flowing through Google every second and siphon it off for yourself! So the risk is totally on me, unless you are absolutely thrilled with the results of this book then at any time within 30 days of purchase just shoot me an email and I will refund every last cent to you - No questions asked! I'm here to run a business so I can't just give the information away for free, but then this priceless information could help you out so much that I don't want to price it out of people's reach, so $9.97 sounds fair to me, I get a fair pay for my work and you get your hands on some of the best Adwords information around at a pittance of other so-called guides. 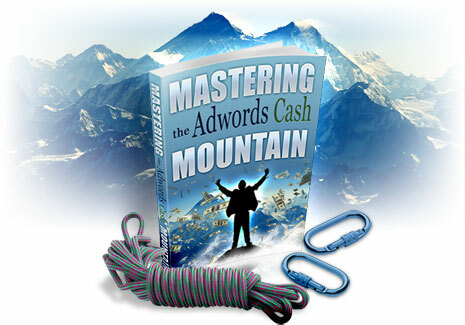 Look at it this way -- $9.97 is really a painless drop in the bucket to be able to get your hands on 'Mastering the Adwords Cash Mountain' and start using it right away to improve your business! If you think this product is a magic pill that will make you money without any effort please do not buy it. You will be required to put effort into learning this system and with Adwords there is a very real possibility you may lose money.